Gábor Hollerung has been the Arts Director (since 2004) of the arts festival which will celebrate its 25 years of remarkable history in 2016 and is organized in August each year. Zemplén Festival is one of the most prominent summer cultural festivals in Hungary, offering a complex range of programs in culture, tourism, viticulture and gastronomy. 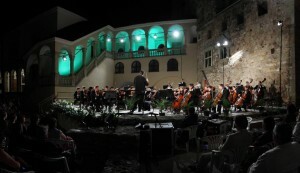 The art festival, launched by Liszt Ferenc Chamber Orchestra in four towns and several small settlements within the region in 1992, has been organized by Interkultur Hungaria Non-profit Ltd. since 2004. A peculiar and wholly incomparable characteristic of Zemplén Festival is its variety of genres, fields and areas which attracts the widest layers of audiences from Hungary and abroad alike, year after year. Prominent classical musical concerts, theatrical, dance and jazz eves, excursions and exhibitions await the public in the most beautiful monumental and outdoor venues in Sárospatak, Tokaj, Sátoraljaújhely, Szerencs and several other settlements in the Zemplén region. Alongside the grandeurs of Hungarian artistic life, several foreign guest ensembles and soloists perform in the Festival. This series of events regularly offers debut opportunities for young artists. The resident orchestra of the Festival is Dohnányi Orchestra, Budafok; and Budapest Academic Choral Society has been a regular performer.